Prof. Mishra has who mentors surgeons and Gynecologists from all over world has received a "Spanish Golden Eagle Award" from The Republican Society of Spain for his Textbook of Laparoscopic Surgery now published in Spanish Language on Sunday 30th October 2011. 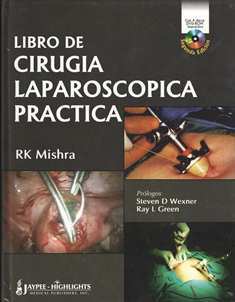 This Spanish translation of original English version of Textbook of Practical Laparoscopic Surgery of Prof. Mishra is recommended reading may be reproduced under "fair use" standards. As stated in Section 107 of The Copyright Act of 1976, factors to be considered shall include: the purpose and character of the use, including whether such use is of a commercial nature or is for nonprofit educational purposes; the nature of the copyrighted work; the amount and substantiality of the portion used in relation to the copyrighted work as a whole for Spanish Surgeon and Gynecologists. The mission of the Republican Society of Spain is "to celebrate the best of international book, to expand its audience, and to enhance the cultural value of good writing in Spain. Textbook of Laparoscopic Surgery is translated in many languages and now available in 1200 book stores all over World. Prof. Mishra who mentors surgeons and Gynecologists from across the globe has received Spanish eagle award from The Republican Society of Spain for his Textbook of Laparoscopic Surgery now published in Spanish Language. The Foreword of this book is written by world leader of laparoscopic surgery Prof. Steven D. Wexner (USA), past president of SAGES and by Dr. Ray L. Green President of World Association of Laparoscopic Surgeons, USA. The Publisher of book of first edition was J.P Brothers Pvt ltd, and publisher of second edition of this book is McGraw-Hill. Even advanced laparoscopic surgeons lack basic principles of minimal access surgery. This book is one of the bestseller book available in laparoscopic surgery through America's largest online book seller AMAZON andWHEELERS. Asked what he felt after receiving the award, Dr. Mishra said he is thankful to Republican Society of Spain who has given him this honour and he said after receiving this award he want to work even harder for the training of laparoscopic surgeons and gynecologists from all over World. On winning the award, Professor Mishra commented, ‘I am delighted to receive this spanish eagle award. I do feel that this improved quality of training in minimal access surgery is making a tremendous difference in helping surgeons and gynecologist who can not read the english text. After asking about the secret of his success Prof. Mishra said: “Honesty, integrity, courage, fairness and a sense of duty is the secret of his success.” According to Prof. Mishra This project was close to my heart because I love the joy of reading. People can't find good books anymore because of all the noise and the glut of merchandise and the perceived irrelevance of medical standards. The prices of books have doubled in the past ten years to pay the costs and salaries of this superfluous marketing. Good writers are being destroyed by the narrowness of the opportunities available. The challenge remains to convince primary care surgeons that, although the laparoscopy involves high cost, it should not be funded through unnecessary budgets and it is possible to perform laparoscopy even in village if the surgeon develops certain basis skill of minimal access surgery. For decades, the World Laparoscopy Hospital has worked with the universities of many nations to help develop the laparoscopic training institutions upon which good surgeons and gynaecologists are built. Through surgeons education initiatives, World Laparoscopy Hospital trains the next generation of laparoscopic surgeons and gynaecologists.